TMWA – What is the Truckee Meadows Water Authority? What is the Truckee Meadows Water Authority? TMWA was created as a Joint Powers Authority under Nevada Revised Statutes Chapter 277 and is subject to the Open Meeting Law. Its Board of Directors consists of seven members representing the Reno City Council (3 seats), Sparks City Council (2 seats) and Washoe County (2 seats). These seven members can be elected officials or appointed by elected officials. For a list of board members visit www.tmwa.com/board. TMWA obtains its water supply from surface water and groundwater sources. Surface water from the Truckee River system, including water released from Lake Tahoe, Boca and Stampede Reservoirs, Independence Lake and Donner Lake, provide most of TMWA’s water supply. The Chalk Bluff and Glendale plants treat the water from the Truckee River prior to it being delivered to customers through a complex distribution system. Groundwater is pumped from wells throughout the service territory and supplements surface water during the summer months. TMWA’s treatment plants consistently produce water that meets or is significantly better than State and Federal Drinking Water requirements. The Chalk Bluff Water Treatment Plant can efficiently supply most of the water needs of TMWA’s entire service territory for much of the year. Originally built in 1994 to replace three outdated facilities and later expanded in 1996 and 2004, Chalk Bluff has the capacity to currently treat 90 million gallons daily and can be expanded in the future to treat up to 120 million gallons per day. The Glendale Water Treatment Facility, built in 1976, underwent substantial upgrades in 1996 and is technologically equivalent to the Chalk Bluff plant. In 2010 the Truckee River diversion into the Glendale facility was upgraded, allowing the plant to treat up to 37 million gallons of water per day. Groundwater sources are a critical component of the TMWA water supply. TMWA currently owns and operates more than 92 active production wells which are used both as a primary source and to supplement the water supply from the treatment plants in the peak summer months while providing backup reliability throughout the year. In winter months, selected wells are recharged with treated surface water to enhance drought supplies and water quality. The distribution system deliver s water from the surface and groundwater sources to customer homes and is comprised of more than 1,901 miles of underground mains and pipelines, over 90 booster pump stations, 140 pressure regulator stations, 92 storage tanks and two treated water reservoirs. 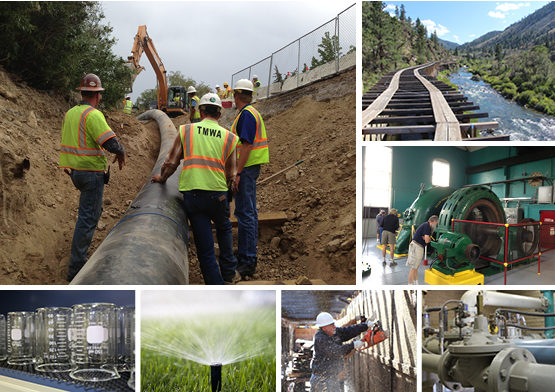 TMWA owns and operates three run-of-the-river hydroelectric generating facilities on the Truckee River that can generate up to approximately 50,000,000 kilowatt-hours of energy and $3 million in revenue annually to the benefit of our customers. TMWA also has a 30 kilowatt solar power generating system at its main office that helps offset power costs at that facility. Under optimal conditions, TMWA can generate more power from its renewable energy sources than it consumes in the entire water system (supply, treatment, distribution and office power usage). To learn if you are served by Truckee Meadows Water Authority, please visit www.tmwamaps.com. TMWA’s highly skilled workforce holds more professional licenses and certifications than any other water utility in Nevada.